Found 2 file extension associations related to Art Explosion and 2 file formats developed specifically for use with Art Explosion. Art Explosion. It’s the brand that computer users everywhere keep coming back to again and again. And for good reason. 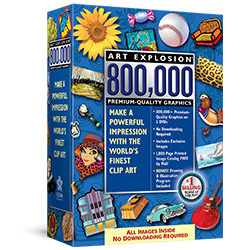 Art Explosion products are well known for unparalleled variety and the highest quality possible. And they offer the kind of truly stunning artwork that is missing entirely from other collections. If you need more information please contact the developers of Art Explosion (Nova Development Corporation), or check out their product website.